Coming back today with 36 runners instead of the 27 originally planned, we were a little afraid that we could be in for a long one. But as it turned out, a steady stream of bustouts saw us finishing at a surprisingly reasonable hour. After frankly dominating the last couple of levels, Jason Mercier goes into the final as massive chip leader. However, there's a lot of play left in this tournament yet, and we wouldn't like to call it between this fearsome lineup. Join us back here at the Empire tomorrow from noon GMT+1 for what will by any standards be a pretty interesting final table. Until then, it's goodnight from us, and it's goodnight from them. 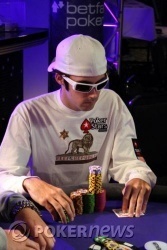 Jason Mercier raised in early position, only for official short stack Eric Liu to move all in. 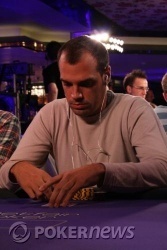 Folds all around the table, and back to Mercier, who tanked up. Eventually he called. Ladies and gentlemen, Day 4 is over. It's been a cagey start so far to this last remaining table, with everyone mustard keen to make it through to tomorrow's final. 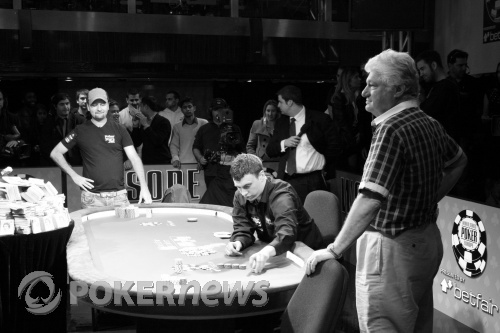 It's mainly been uncontested pots preflop with the occasional battle of the blinds, but it's surely only a matter of time before we see a showdown. 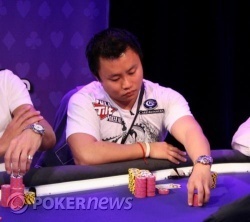 At the moment, Eric Liu is your current short stack with 325,000. He has about 16 big blinds. As we have 10 runners on a nine-handed televised table, seats nine and 10 are sharing a hole card camera. That'll be fun. Just one more player needs to bust out before we can all go home. Joy! Keith "Camel" Hawkins raised to 52,000 under the gun and it folded around to Praz Bansi on the button, who made it 200,000. Back to Camel, who announced all in; then back to Bansi and he announced call. All of this swiftly, quietly and with the absolute minimum of fuss. Like gentlemen. Camels can go for weeks without drinking, but this one will be hitting the bar directly, we suspect. We are down to 10. Back on the feature table - it's manic here all of a sudden - it looked like Chris Bjorin raised to 67,000, Daniel Negreanu called and Markus Ristola moved all in for 620,000. Both opponents folded. On the very first hand back after the break, James Akenhead raised it up preflop to 55,000, Thomas Bichon moved all in for 143,000 and the Akinator made the call.